Despite the last arc, Operation Deadside, starting out pretty great, when it came to it’s conclusion I was left a little disheartened; it’s still a good story, and worth reading, but the final issue felt it lacked something that was present in the previous three. Something this issue has in spades. 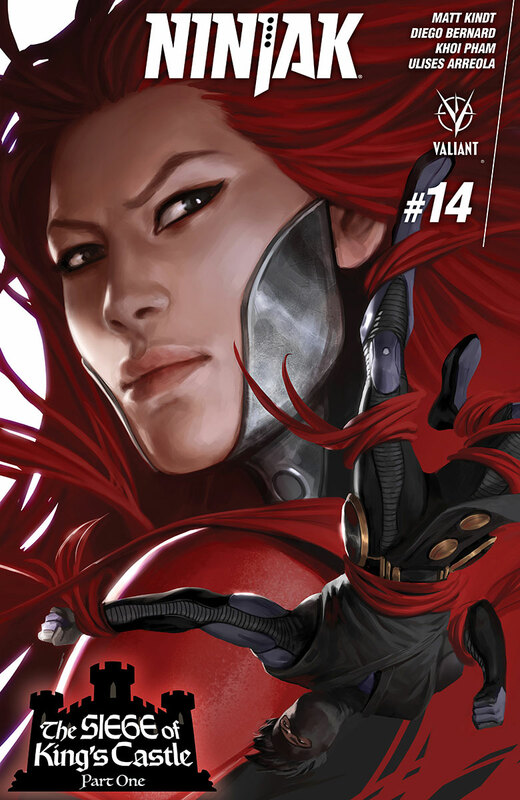 Ninjak #14 is one of the most interesting issues of the series I’ve read to date, and it’s entirely because Colin King is caught so off guard as the comic progresses. In just a handful of pages Matt Kindt sets up a fantastic story by taking everything from Ninjak and forcing him to quiet literally go back to basics in terms of equipment and resources, which I really enjoyed after Operation: Deadside‘s more technologically outfitted focus on Ninjak‘s abilities. The opening chapter to The Siege Of King’s Castle is very new reader friendly to the point where you don’t actually need to read the preview page; indeed, I think I listened to an interview with Matt Kindt where he explained that this was written before the previous story, so you don’t even need to read that one either, if my memory of the interview is correct (which at least as far as this issue goes is very true, but that may not be the case going forward in the story). In any case, all you really need to know about Ninjak to enjoy this issue is explained on the very first page, which really does make this an ideal place for new readers to jump on. Ninjak #14 also kicks off a new story in the back up The Lost Files which looks fantastically interesting, and should provide some fleshing out of something that I’ve been wanting for some time, so I’m happy that – at least based on the first chapter – it looks like we’ll be getting just that. Overall, this is one of the stronger issues of Ninjak I’ve read in some time, and as the opening chapter to a new story arc, it’s a very accessible one to new readers. Whether the arc continues to build on the promise shown here only time will tell, but I’ll be along for the ride. I’m really impressed with so much of what the Valiant guys are creating. I think they have the best superhero universe going right now and consistently put out great material. It’s so impressive what they’re doing. The best part about Valiant’s output is that it’s also really new reader friendly. Almost every new arc can be a jumping on point.